Exactly what it says in the name, Tandoor Chop House has taken the meatiest of meats and introduced them to the mighty tandoor, and the results are great. The one thing that you will instantly notice when walking towards the restaurant (conveniently located off the Strand and near the backstreets of Soho) is the amazing smell. The intense aroma of grilled meats, spices and smokey BBQ entice you in even before you know where you are going. As soon as you enter, the smoke and smells wrap themselves around you like a warm blanket and invite you to camp up and eat your way through their extensive menu. Once seated, our mouths were already salivating thanks to the aromas and food envy from neighbouring tables. We then looked over the menu and began ordering to our heart’s content. To start, Dexter Beef ‘Dripping’ Keema Naan with Green Chilli & Yoghurt, Heritage Tomato Uttapam with Green Chilli & Garlic Hung Curd and Bhaji Onion Rings with Burnt Garlic Chutney. All were outstanding! The meat so so flavoursome, the tomatoes on the uttapam were so fresh, like they had been picked 10 minutes before being plated and the onion rings were really light. To follow we went for the Amritsari Crispy Lamb Chops (obviously! ), House Tandoor Chicken and the Lasooni Paneer with sides of Garlic & Cheese Naan, Tomato & Smashed Kachumber Salad, Black Dahl and Gunpowder Fries. The meat on the chops fell off the bone and was so succulent we wish we ordered two portions. The chicken was tender and packed full of flavour, hard to achieve with tandoori chicken sometimes! The paneer (which is made in house) was light and fluffy and so creamy you can tell a lot of love goes into making it. All the sides were excellent; so much so, we ordered more fries! We of course tried desserts and have to admit that they did not live up to the rest of the menu. Indian desserts are always hard to get right so we can forgive them for this. We sampled the Coal Roasted Pineapple with Honeycomb Ice Cream and the Halva “Sticky Toffee” Pudding & Clotted Cream. Thankfully the honeycomb ice cream was really tasty so that saved the desserts for us! 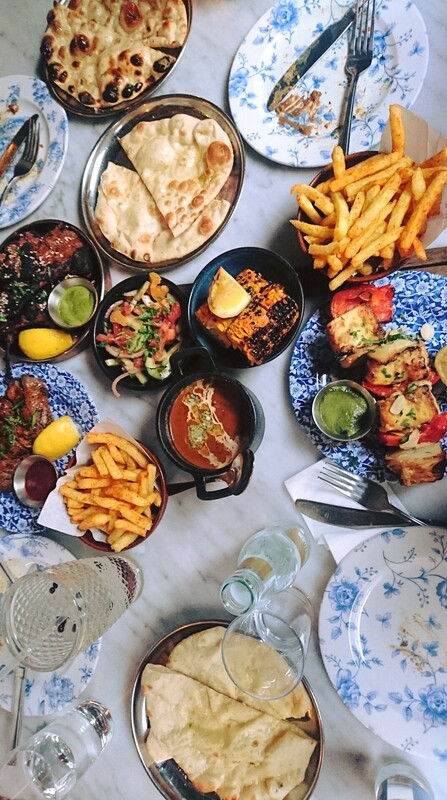 Yet another great Indian restaurant to join the bustling London scene and one that we definitely will be going back to, for the beef dripping keema naan alone!